Hi Compulsive Reader readers!! My name is Julie Linker, and I’m doing today’s guest blog! Which I’m pretty excited about because I’ve never done a guest blog before. At least, not the kind where I can write about whatever I want, anyway. So, this is pretty cool. I’m tempted to write about the Oscars because I’m a total celebrity-junkie, but, um, I think the point is for me to write about my book. Which is called Crowned. It’s a story about two rival beauty pageant queens. I wish I could tell you I decided to write about pageants because I’m a former Miss America or something, but sadly—no. I’m not a former anything. Although I did make the top ten at the county fair queen contest when I was in high school. Does that count? My littlest sister, on the other hand, was really big into pageants, right up until a couple of years ago. Even better, she actually won stuff. Although sadly, never the state pageant. The state pageant is THE pageant because that’s how you get to go to Miss America. Or Miss America Outstanding Teen, depending on how old you are. Neither one of which are in any way related to Miss USA or Miss Teen USA. Zip. Zilch. Nada. America and USA are two totally different things. But we won’t get into those little details, or else this post will be five pages long. Speaking of Miss America, though, did anybody watch it last Friday night? SPOILER ALERT—I’m going to talk about the winners (in case any of you taped it, but haven’t watched it yet). Miss Indiana, Katie Stam, won. Deservedly, but I have to admit that I felt a little cynical when I was watching it. Like it was all so predictable. She’s tall, brunette, had on a white evening gown (which, incidentally, looked a LOT like the evening gown last year’s Miss America won in), sang for her talent. It’s like the only thing that’s ever different from year to year is the date written on the sash. Figuratively speaking, of course—the Miss America system actually did away with sashes a while back. I don’t know. Maybe I’m just getting old and jaded. Not that I’m going to stop watching pageants or anything. No way! Sparkly gowns, high heels, big hair—I’m a sucker for all that stuff, even if it is sort of politically incorrect in this day and age. Aaaack! I have so much more pageant-stuff I want to talk about, but we’re in the middle of a giant ice storm and I think our electricity is about to go out. Again. But please visit my blog sometime at http://www.julielinker.com/. And please pick up Crowned! Also, I’m doing a giveaway in conjunction with The Compulsive Reader! A year’s subscription to Pageantry magazine, plus signed copies of Crowned and my first book, Disenchanted Princess. Plus, signed copies of Kate Perry’s book Project Date and the soon to be released Marked by Passion, the first book in her new Guardians of Destiny series! Which is a seriously awesome series, and I’m not just saying that because she’s one of my BFFs. To enter Julie's awesome contest, just leave a comment here (no lame comments, please!) in order to be entered! This contest will run for a week! Great post. Your books sound really good. Sounds like a great prize. Can never have too many books and these all sound great. I really want to read Crowned and the others sound great! Please enter me. I have never heard of Julie Linker before, but she sounds like a fun author! I too am a pageant junkie. I have never been in one, but I can't help but watch them on TV. Miss America is so much better than Miss USA! I also watch documentaries and Toddlers in Tiaras. I think I would really enjoy her books too. I love picking apart pageant stuff, they have this sort of soo bad but ooh soo good feel! 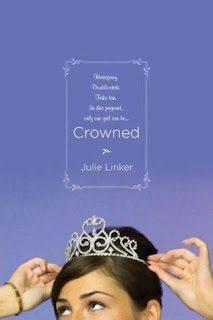 I can't WAIT to read Crowned! and enter me! These books sound fantastic. Sadly, they have stopped sending the Miss Sweden contest in my home country... The contest is still running, but not airing onTV. Great to hear the author's perspective! Now I'm really curious about the difference between America and USA. I always got flyers to participate in USA pageants and wondered how they got my name. Also, I'm relieved there are no ice storms in my area. 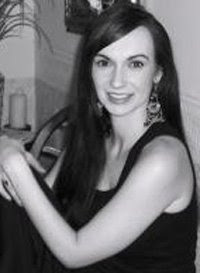 Great guest blog! I've seen Julie Linker's books on the shelf, so it's nice to know something about the author. I love watching beauty pageants! I remember watching Miss Universe for last year and it was quite inspiring! I used to watch beauty pagents regularly some years back. Especially after quite a few Indian girls won the contest. But I guess they started getting repittitive. 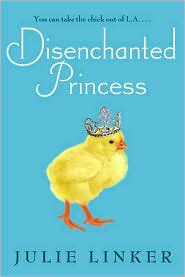 The cover of Disenchanted Princess made me laugh out loud. This sounds like a really cool contest! The books look pretty interesting. How fun, thanks for the contest. Cool contest and awesome post! Please enter me!! Good Luck everyone! Would love to be included in the drawing! ~ :) Thanks! Enter me please! These books look awesome! And I love the color of the Crowned cover! Great blog post, great contest! I'd love to be entered--into the contest--not a pageant!! Enter me... now... please!!! The books sound awesome! Great post! This sounds so awesome and I would love to be entered to win! Thanks!